Salted Lemon Ice Cream (no machine) | ohcrumb! It’s winter in the northeast, and I don’t have an ice cream maker, but I don’t care – I’m making this again soon. Simultaneously bright, sweet, tart, and salty, this is what turned my ice cream world upside down and introduced me to the world of preserved lemons a couple posts back. Or it’s my homage to it anyway. I never knew it was possible to make passable ice cream without a machine or rock salt until I saw David Lebovtiz’s post on how to do so. I filed it away in my memory, a little hesitant to try because it required a little bit of elbow grease and a lot of patience…and unfortunately, I’m not great at either. After my incredible eye-opening ice cream experience however, there was no question. It was time. Use RealButter’s recipe for lemon ice cream stuck out to me, because she mentioned it had the bright, tart flavor of real lemons. Sounded like just what I was looking for! 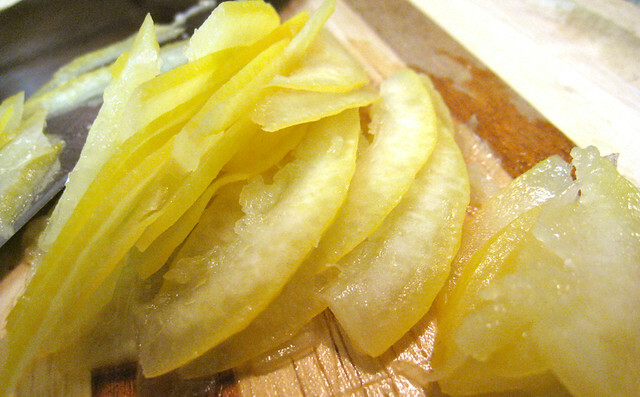 I replaced some of the fresh lemon zest with preserved lemon, but kept some of the fresh stuff to keep the brightness. The resulting ice cream was bursting with flavor. I personally loved the tartness and boldness of flavor. So. Good. However, my dad preferred something milder, so I’ve included a range of suggested measurements for the lemon and lemon juice below (juice lends tartness, peel lends flavor). The texture of the ice cream using this method turned out a lot better than I expected – not as smooth as store-bought stuff, but not too icy either. 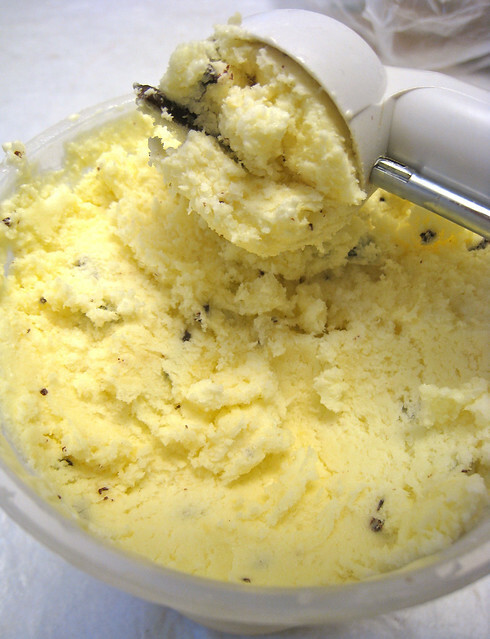 Based on the comments on Use Real Butter‘s post, this recipe will yield very smooth and creamy machine-made ice cream. 1. Combine the lemon zest, juice and sugar in a non-reactive bowl and refrigerate. 2. Combine the heavy cream and preserved lemon in a bowl and refrigerate. 3. Heat the milk in a large saucepan until just barely boiling. Then remove from heat. 4. In a large bowl, beat the egg yolks and whisk the warm milk into the yolks. 5. Pour the egg yolks and milk back into the saucepan. 6. Over medium low heat, stir constantly until egg/milk mixture reaches a nappe consistency (coats the back of a spoon). 7. Strain the custard through a sieve and refrigerate until completely chilled. 9. Pour into a shallow freezer-safe pan. Place in freezer. 10. After 45 minutes, the mixture should be beginning to freeze at the edges. Stir vigorously with a spatula, whisk, or hand-held mixer if you have one. Really beat it up and break up any frozen sections. Breaking the frozen crystals that form is what gives you a smooth texture. Don’t leave it out of the freezer for too long though, or your ice cream will begin to melt. * Neat little tip: Make Stracciatella ice cream (ice cream with Italian-style chocolate chips) by drizzling pure chocolate ove the almost frozen mixture, then stir to break up the ribbons of chocolate as they start to freeze. Drizzle melted chocolate over the ice cream while it is freezing. Small ribbons result in fine bits, large ribbons will result in large chunks. Stir to break up the chocolate as the chocolate begins to set. 12. Keep checking periodically and stirring until the ice cream is frozen to your liking. It will likely take 2-3 hours to be ready. 13. Transfer the ice cream to a covered storage container until ready to serve. That looks awesome – YUM! Pics are awesome and are making me want ice cream even while I am freezing from the weather. :) Thanks for the links! I want to try this too. Thanks! It’s always a good time for ice cream :) I’d love to hear how it turns out if you do.